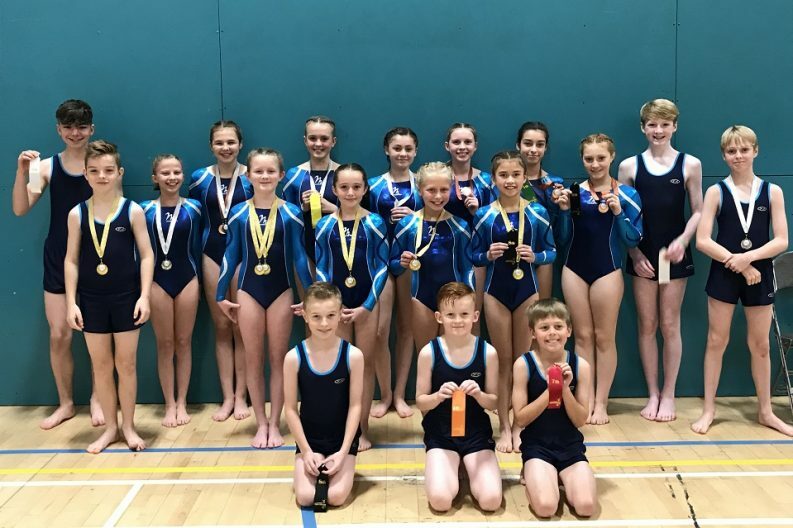 A group of youngsters from Oldmeldrum-based ETKO Gymnastics returned from the recent City of Glasgow Floor & Vault Competition with a large haul of medals. 32 boys and girls from ETKO Sports Academy’s competitive gymnastics programme took part in the event at Glasgow’s Bellahouston Leisure Centre, which was attended by over 20 clubs. The four-strong 10-11 beginners girls’ team struck gold in the team event, with ETKO gymnast Madelyn Mair placing first overall individually. There were further successes for the club’s 12+ girls, whose A and B teams placed second and third respectively, and for their 8/9 A team girls, who took silver in their age category. There was a further strong showing for the club in the boys’ events with Roo Jackson and Angus McKay placing first and second in the 12+ beginners competition. Finlay Robinson struck gold again for the boys in the 10/11 intermediate round, with Ryan Skene clinching third place in the 8/9 beginners. ETKO Gymnastics club members train within ETKO Sports Academy’s purpose-built centre, which is fully equipped with a sprung floor for practising routines, plus competition-standard apparatus. The club’s competitive programme is led by head coach and former international gymnast Laura Etko, who is also the founder and director of ETKO Sports Academy. Commenting on the latest competition results, Laura said: “Our instructors and gymnasts worked incredibly hard in the lead-up to this event, giving up additional time for extra training sessions. The club’s gymnasts now have their sights set on their next event: the WA Floor & Vault Competition at Perth’s Bell Sports Centre on Saturday, 24 November, where they hope to build on their Glasgow success. ETKO Sports Academy, the training home of ETKO Gymnastics, offers gymnastics, wrestling and other sporting opportunities for all ages, from baby gym through to teen and adult fitness classes.